The past year has been good to Genesis—and its fans. The English prog-rock pioneers had pretty much been off the radar since the 2007 reunion tour of the Phil Collins-led lineup, but little has been heard from the band since. In 2010, Genesis became one of the few progressive bands to be inducted into the Rock and Roll of Fame. That was nice, and long overdue—but with Collins’ 2011 retirement from music, little has been heard from the band. That changed in 2014 with the announcement that what many fans consider to be the classic lineup of the band—Collins, original singer Peter Gabriel, guitarist Steve Hackett, bassist/guitarist Mike Rutherford and keyboardist Tony Banks—would reunite, not for a tour or album but to be interviewed for a new documentary, Sum of the Parts, which premiered on the Showtime cable network late last year. That documentary is now out on Blu-ray from Eagle Vision, and its release coincides with Eagle Vision’s first-time-on-Blu-ray release of Three Sides Live, a concert documentary filmed in 1981, a significant time in the band’s post-Gabriel development. Watching the two Blu-rays in the same time period offered two unique perspectives on the band and its history. The two discs also provide interesting contrast in terms of video production values, then and now. 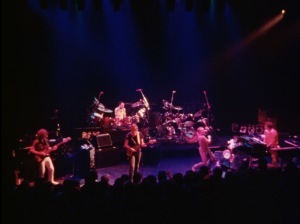 Three Sides Live documents the band’s tour supporting its 1981 Abacab album. 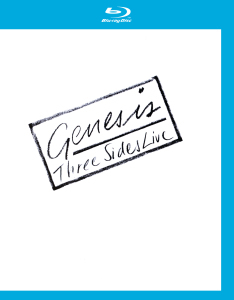 This was the third Genesis album created as a trio following Hackett’s 1977 departure for a solo career, and it was also the point at which Phil Collins’ pop/R&B sensibilities (further explored that same year with his debut solo album, Face Value) would start to have a major (and lucrative) influence on the band’s music. The tour documented in this film featured Genesis’ by-then-solidified touring lineup of Collins, Banks, Rutherford, and guitarist/bassist Daryl Stuermer and drummer Chester Thompson, brought in to augment the band since Collins and Rutherford were both doing double-duty (via overdubbing) on the studio albums. The film is very much a product of its time. The choppy editing and sometimes-awkward cuts between music (frequently in mid-song) and documentary/backstage footage can be jarring, but feels familiar to anyone who’s seen concert films made during this early era of music video. Voice-overs from interviews are interspersed over live music. The concert, also documented on a live two-record set released in 1982, found the band leaning heavily on material from Abacab and Duke, while still paying homage to the Peter Gabriel era on a few tracks. 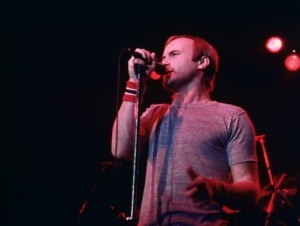 The concert footage shows Genesis in fighting trim, playing fun, energetic versions of radio-friendly hits such as “Abacab” and “Turn It On Again,” with Collins’ onstage charisma a deserved focal point for the reorganized band. Steurmer and Thompson added to this energy with the jazz and funk feels they brought to the music, and a newly playful side of Rutherford emerged onstage. Banks was unchanged from years past—stoic, focused, barely cracking a smile—understandable given the pivotal role of his symphonic keyboards in Genesis’ music, even as it got simpler over the years. The Blu-ray does have some stunning performances—the “In the Cage” medley of Gabriel material is a standout. The documentary footage is interesting—backstage footage, travel scenes and radio interviews in which Collins gives historical background on the band that contrasts interestingly with the new interviews in the Sum of the Parts Blu-ray. While Collins seemed carefree and press-friendly in 1982, in the 2014 interviews he is reflective, moody and at times brutally honest. Sum of the Parts is, of course, a flat-out documentary with brief moments of music videos and concert footage. The centerpiece of this film is the recent interview footage featuring the five members of the classic lineup individually and together. The group interviews are especially interesting when the discussion gets frank and even, at times, a little tense, no more so than during a segment on Lamb Lies Down on Broadway. The two-record rock opera would end up being Gabriel’s final work with the band before his exit for a solo career, and Banks didn’t particularly care for it—and still doesn’t. As Gabriel visibly bristles on camera, Banks recalls how he wasn’t fond of the sprawling masterpiece’s bizarre storyline and theatrics, perhaps giving us a glimpse of the rift that led to Gabriel’s departure. Some old grudges never die, apparently. It’s fascinating moments like this that make Sum of the Parts such a rewarding program, especially for longtime Genesis fans like this writer. Unlike the Three Sides Live interview footage, which found Collins and Co. in thumbs-up, everything’s great mode as they propelled the band to its greatest commercial success, Sum of the Parts finds the band in reflective, honest mode—not promoting anything, just recounting their history, five old friends having a laugh as they recall all of the amazing music they made—and adventures they had—together. One criticism I had upon watching Sum of the Parts on Showtime—and again on Blu-ray—was how it downplayed the contributions, and especially the post-Genesis achievements, of certain band members. Guitarist Anthony Phillips, who was a vital part of the band’s first lineup—probably its most accomplished musician at the time—isn’t heard from in this special following his exit from the band. The same goes for Steve Hackett, who was a major component of the band’s two initial post-Gabriel releases. Although both have had distinguished solo careers—with Hackett remaining a prolific recording and touring artist to this day—after they leave the band, they disappear from this film. The same can’t be said for Gabriel, as the filmmakers parallel the rise of his solo career with that of his former band. Collins’ solo work also gets plenty of airtime here, as do Rutherford’s work with Mike + The Mechanics and Banks’ solo ventures, which have included two acclaimed orchestra albums. But Phillips and especially Hackett get short-shrift here, undeservedly so in this writer’s opinion. Sigh. A good portion of the documentary is devoted to the Collins years—which makes sense, since he was lead singer for the majority of the band’s existence. But what about what happened after Collins left the band in 1996? Singer Ray Wilson fronted the band for a final Genesis studio album, Calling All Stations, released in 1997—but you’d never know that from this film, in which Collins leaves and the band, seemingly, is done. No mention of Wilson whatsoever. I know you can’t cover every facet of a group with a close-to-50-year history in one documentary, but it would have been nice to at least acknowledge the Wilson period, short-lived though it was. So Sum of the Parts does not cover all phases of Genesis, and at least in my opinion doesn’t play fair in screen time for all members. But it’s still a damn good doc, probably the most thorough one yet on the band. And it’s a sheer thrill to see the five members of the classic lineup together again, even if they’re just sitting and talking rather than playing together one more time. Three Sides Live doesn’t aspire to be as thorough; rather, it’s a time capsule capturing the band at a fertile, fiercely creative junction. The production values (full screen ratio, grainy film) are pure 1982, but the content is fascinating. Sum of the Parts boasts 2014 production (sharp hi-def video!) and well-executed editing for a more comprehensive narrative. 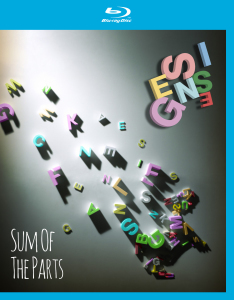 Sum of the Parts adds bonus interview footage, some of which is very valuable and insightful; otherwise, it’s the film that aired on Showtime. The Blu-ray picture and sound are top-notch. Combined, the two releases are a superb set of bookends for a band that created music that will live on forever.